A couple of weeks ago I asked your opinion on what I should wear to one of my BFF's wedding receptions. I ended up choosing what most of you chose, the pink polka dot Hazel paired with a black cardigan and thin black belt. Unfortunately, I was too busy having fun and didn't take many pictures while at the wedding reception, so I took some photos in the dress this past weekend. This is one of the only pictures I (Luke) took, but at least it has the bride in it! 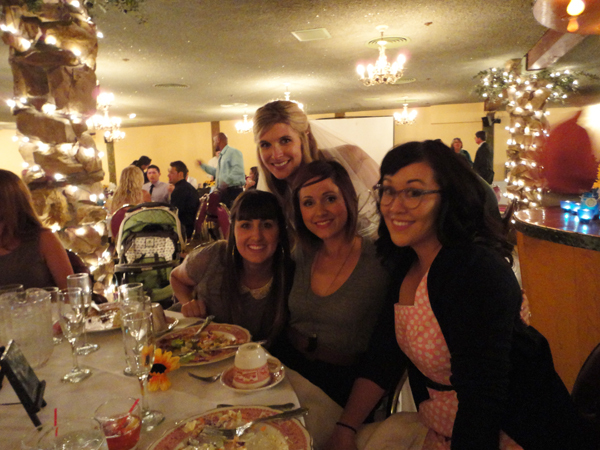 The photo is of Taryn, Amy, and myself, with Megan up above. She was a beautiful bride and I couldn't be more happy for her and Matt. I didn't get to talk too much with her (there were a lot of people there), but I was so happy to be at her special day. My friends and I all got to sit together and we had fun. Plus there was a crazy drunk girl at our table that embarrassed herself (only she doesn't know it) and gave Luke and I comical parenting advice (we don't have kids). That's a whole other story that I will probably post about in my Live Journal haha. This weekend I wore the Hazel again and made sure to take pictures. I decided to take these in my "new" bedroom. Well, the bedroom isn't really new, but it feels new since we switched rooms and got a couple of pieces of new furniture. Pretty much the same photo as above, but Lebron decided to join me in this one. What a guy. Alright, let's talk about the dress. I love the fabric I chose and you would think that since this is the third time I have made the dress that I would have the fit down. Well, it appears that I don't :( In this version of the dress (not the others) there are vertical lines in the bodice area. It's wearable and not a huge deal, but still kind of a bummer. Next time I will do better, yes, there will be a next time! 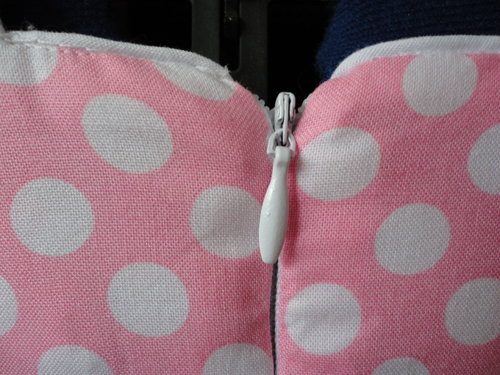 My invisible zipper skills are improving with each garment! This version of the Hazel took me a bit longer to make because I added white piping all along the top of the bodice and the straps. It adds a nice touch, don't you think? Alright, back to Megan. 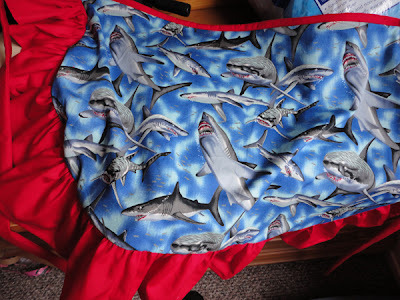 For her wedding gift I made her this shark apron. Her favorite hobby is fishing and her goal is to catch a shark, so I thought that a shark apron would be appropriate. In her card I told her that I hope she can wear this while she is cooking her first shark. Love the white piping addition - it really steps the dress up a notch! omg we should be lj friends. Yes, let's be friends! I'm crayolacreepy on there. Just to warn you, it's my spot to vent, so there are definitely some angry posts haha. What's your name on there? I'm sceneasfuck - and don't worry, I save all my mean posts for lj (it's friend-locked!). I'm gonna find you now!! Ohhh.. I miss Lj! There was a mass exodus (damn Facebook) in my friends group a few years back and it was never the same. Love the dress! While the fit looks great in the pictures, I wonder if the fabric is the culprit behind the bodice's vertical lines? There isn't rayon in it, is there? How did you find the Madonna Inn? We went a few years back for a friend's 30th. It was perfectly tacky. We stayed in two different rooms, one of which I can't remember. The other was a caveman room with a bathroom made of stone. Our friends had a really neat suite that was all blue with mirrors and glass. It even had a spiral staircase that led to a little lookout. Btw, are we neighbors? I'm in the bay area and always assumed you were from southern California. Am I wrong? The dress is cotton, no rayon that I am aware of. For version four I'm going to try a different fabric because that's probably my problem! Ooh, I love, love, love your pink polka dotty goodness of a Hazel!!! Kudos on that awesome invisible zip! Your Hazel looks fabulous. Love the dots and piping. I'm finding it a sucker of a pattern to fit- I think it will be a long labour of love. 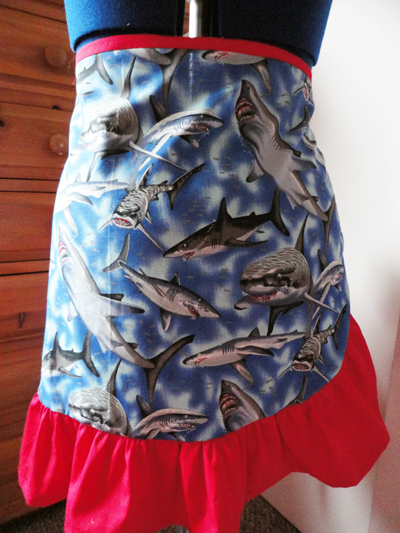 Shark apron is tres rad! Love to polka dot version of this dress - I am having fit issues with mine too. I am sure we will get there in the end. As always, adorable! So darn cute. You can never go wrong with polka! Polka dots are just the best. The shark apron is awesome!! Love the polka dot Hazel and your invisible zipper skills totally rock! Love the piping - it gives the dress a lil bit extra pizazz :) The shark apron is brilliant and a perfect gift for your friend! Thanks, Meg! My friend texted me last night and told me she loved the apron, it made my night! You sure looked fabulous at Megan's shower. Every party always seems to have its pooper. Luckily, the party pooper at this party gave you something to laugh about. The dress looks great and I have full faith that on the fourth try, you will get it perfect! How flippin' cute is this dress?! Love it! More brilliant creations. You are adorable in your Hazel, and that shark apron rocks!!! 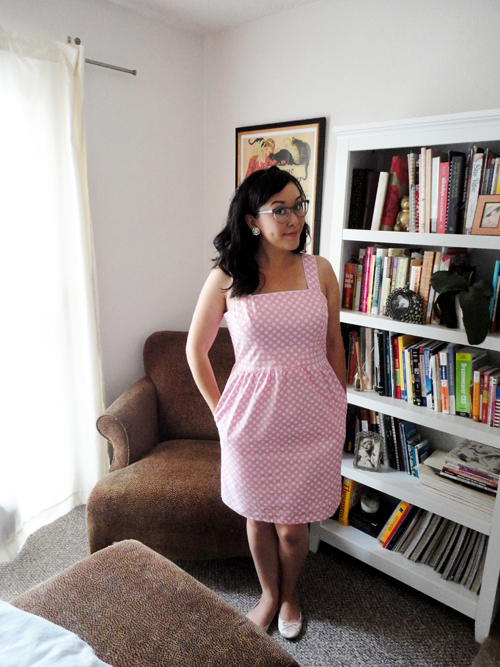 I do love polka dots - you do pink-polka a fabulous service - love this dress on you! Really cute! 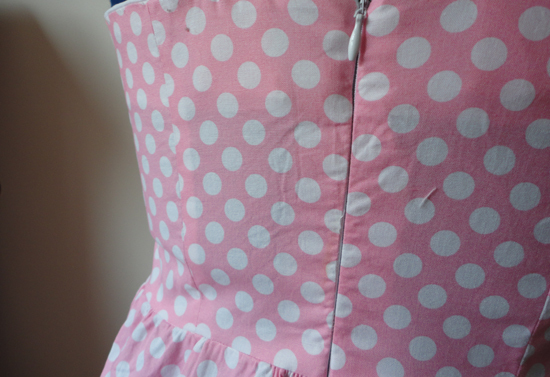 I love the piping and the pink polka-dots. Adorable! Don't you just love polka dots? They make anything cute.